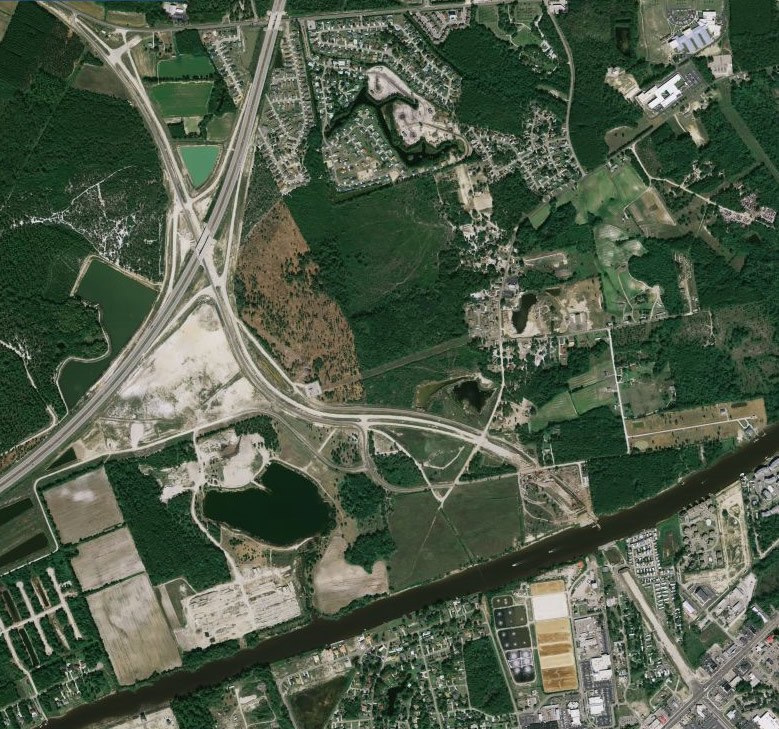 Designated S.C. 31 Connector, the North Myrtle Beach Connector (Robert Edge Parkway) starts at S.C. 90 just west of S.C. 31 (Carolina Bays Parkway) and travels southward 2.30 miles across the Intracoastal Waterway to U.S. 17 (Kings Highway) at Main Street in North Myrtle Beach.4 The expressway opened to traffic on September 3, 2009. Built as an at-grade route with a diamond interchange at Carolina Bays Parkway, Interstate 174 is no longer a likely designation for this route. The North Myrtle Beach Connector was renamed Robert Edge Parkway after the first mayor of North Myrtle Beach. Interstate 174 was a proposed designation for the North Myrtle Beach Connector per failed House of Representatives Bill H.3462/Senate Bill S.0291. “The North Myrtle Beach Connector as Interstate Highway I-174. Aerial view of North Myrtle Beach Connector construction between U.S. 17 (Kings Highway) and South Carolina 90 north of the Carolina Bays Parkway. Old Sanders Drive ties into Robert Edge Parkway from the south at a signalized intersection. Part of the North Myrtle Beach Connector involved building a 230 foot long span (J. Bryan Floyd Bridge) across the Intracoastal Waterway. Highway 22, the Conway Bypass, known as the Veterans Highway, as part of new Interstate Highway 73 (I-73) if the South Carolina Department of Transportation through engineering and consultant professionals on highway construction determines this is the best route. 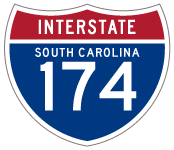 any consideration of routing of Interstate 74 in South Carolina may be considered by South Carolina after engineering and highway consultants determine the best and most cost effective route that safeguards the environment, and only after North Carolina formally agrees to an acceptable time cycle to complete the North Carolina section of Interstate 73 from Rockingham to the South Carolina state line, near Bennettsville, South Carolina. Interstate 174 had exactly the same language in both bills, so it was anticipated to remain once the House and Senate agreed to a compromise for this bill. Between January 2003 and March 2004, South Carolina Bill 3462 was negotiated and deliberated between the state House of Representatives and Senate, but it was not approved and made into law. As a result, the resolution of support for Interstate 174 was stymied. Nevertheless, according to Myrtle Beach Online, the construction of the North Myrtle Beach Connector was to commence in early 2005. Even so, politics governed the development of this road. The mayor of North Myrtle Beach was “insulted” by a low offer for a portion of her land that was in the path of new roadway.5 Nevertheless, land acquisition and project construction remained on schedule with completion anticipated by late Summer 2009,6. The diamond interchange joining S.C. 31 (Carolina Bays Parkway) with Robert Edge Parkway lies just east of the North Myrtle Beach Sports Complex and south of S.C. 90 at Champion Boulevard. Robert Edge Parkway (S.C. 31 Connector) lowers from the J. Bryan Floyd Bridge to conclude at an at-grade intersection with U.S. 17 (Kings Highway) and Main Street in the city of North Myrtle Beach. Page updated August 20, 2014.